Sagarmatha is an exceptional area with dramatic mountains, glaciers and deep valleys, dominated by Mount Everest, the highest peak in the world (8,848 m). Several rare species, such as the snow leopard and the lesser panda, are found in the park. The presence of the Sherpas, with their unique culture, adds further interest to this World Heritage Site (UNESCO). 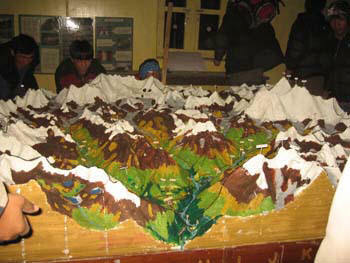 The 1:20,000-scale Participatory 3D model of Sagarmatha National Park and World Heritage Site was completed in December 2007 in the framework of the Hindu Kush-Karakoram-Himalaya (HKKH) Partnership Project. The 3D model covers a total area of 1,400 sq km covering elevations ranging from 1,700 m to 8,848m a.s.l. It was built as part community based planning exercise in the context of the management of the protected area. The model has been used for documenting and locating natural and cultural heritage sources as well as serve as source of information for visitors. Depicted data reflect the knowledge of 21 community members representing a wide cross-section of the communities in the park. The 3D model is now stationed at the park entrance gate in Monjo where a visitor information centre has been developed. (Menris ICIMOD 2007). ICIMOD. 2007. 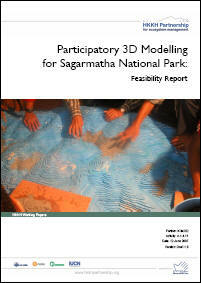 Participatory 3D Modelling for Sagarmatha National Park: Feasibility Report. HKKH working paper, ICIMOD, 19 pp.